The Monk-Martyr Lucian, Presbyter of Antioch, was born in the Syrian city of Samosata. At twelve years of age he was left orphaned. Lucian distributed his possessions to the poor, and went to the city of Edessa to the confessor Makarios, under the guidance of whom he diligently read Holy Scripture and learned the ascetic life. For his pious and zealous spreading of Christianity amongst the Jews and pagans, Lucian was made presbyter. At Antioch Saint Lucian opened a school, where there gathered many students whom he instructed in book wisdom. 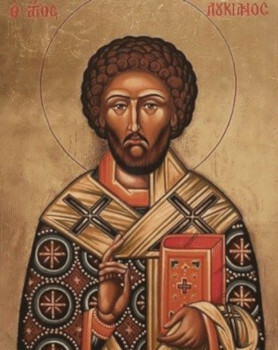 Saint Lucian occupied himself with teaching work, and he corrected the text of Holy Scripture, having been corrupted by copyists and heretics. (The entire Greek text of the Bible corrected by him was hidden away in a wall during the time of his confessor’s deed, and it was found during the time of Saint Constantine the Great). During the persecution of Diocletian, Saint Lucian was arrested, having been informed on by heretics, and he was dispatched to prison in Nicomedia, where over the course of nine years he encouraged Christians together with him in the confessor’s deed, urging them not to fear tortures and death. Saint Lucian died in prison from many terrible tortures and hunger. Before death, wanting to partake of the Holy Mysteries of Christ on the feast of Theophany, the hieromartyr, bound by chains to a box, was compelled to offer the Bloodless Sacrifice upon his chest, and all the Christians situated there in prison communed. The body of the holy martyr was thrown into the sea, but after thirty days dolphins brought it to shore. Believers with reverence buried the body of the much-suffering Saint Lucian.